PURE FLORIDA: Rainy Season Gator Gift ...hmmm ... can a dilemma be a gift? Rainy Season Gator Gift ...hmmm ... can a dilemma be a gift? Like many surprises, the Great Rainy Season Gator Gift happened during a break in my routine. Normally, when I get home from work I park the JEEP, load up with my school gear, and trudge up the walkway to PFHQ. For some reason about 2 weeks ago, I left the baggage in the JEEP and walked down to the pond. I was curious about the water level in the pond. Our long cool dry spell had broken with a wet fury that pushed rain across us almost daily. A system I installed years ago shunts rainwater from our steep roof down to the pond, so I was expecting a nice rise in her water level. Let me tell you about our pond before I get to the good stuff. The pond is long and narrow with a cypress, red maple, willow, and buttonbush swamp at the south end and a few planted cypress trees along the north end. In the center of the west bank, beneath a shady black willow tree, stands a small dock ... one badly in need of new decking. During good Hurricane seasons, the dock which is currently about 5 feet above the pond surface, can be under 2 feet of water. I share this so you'll understand that our pond is always changing and always hosting different populations of flora and fauna. During very long droughts, the pond can go completely dry. When the rains come again, I replenish the fish from local creeks and ditches, along with the occasional crawfish and tiny freshwater shrimps. Other guests find their own way. 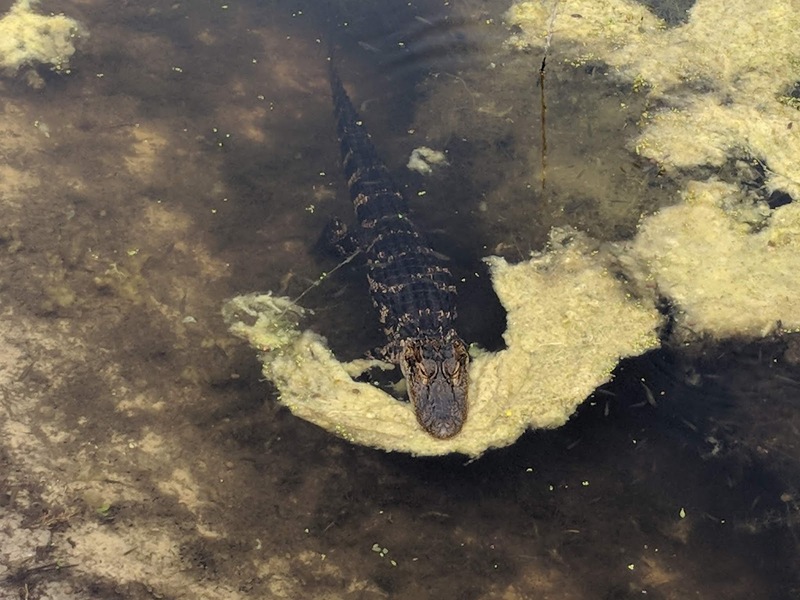 This includes the usual cast of characters, but also a few surprise visitors like the sick brown pelican that spent the last week of his life paddling around the pond before expiring. Once, an otter showed up and stayed just long enough to eat all the turtles and the freshly stocked channel catfish. Last year the surprise was a mated pair of Black Bellied Whistling Ducks and the 8 ducklings they produced. Man I loved that visit. I heard the Black Bellies this winter, even spooked one off the pond, but they didn't stay. I wasn't really thinking about all this the day of the "great routine break". I was just taking a quiet moment to enjoy the pond before starting the second half of my normal after work routine ... greeting our awesome dogs, making supper, etc. As I approached the pond, I took in the brush piles from some recent trimming, the grungy deck with its warped and questionable boards, the blooming buttonbush balls ...and a 5-ish foot gator. He was right at the water's edge and he made no effort to leave, even when I crouched down a few feet away to talk to him. He was so comfortable with my presence that he continued to snap up big female Gambusia minnows that ventured too close. When my crouching legs needed decrouching, I stood up and walked 20 feet away to the dock. 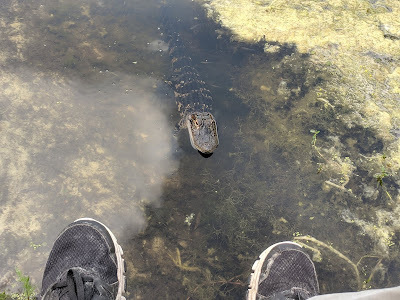 He followed me and stopped just below my dangling feet. His behavior makes me wonder if someone was feeding him at his prior location. It's either that or he is just one extremely confident little gator. He's about 5 feet long, but his attitude is more like 10 feet long. He is actually more of a dilemma than a gift, based on his hissy attitude, lack of fear of humans, and habit of following me as I walk along the bank. The dogs are my main concern of course. We never let them go to the pond off leash and their off-leash outside world is the fenced house yard, but ... they are Labs and if ever they did escape, the pond would be like a big wet Neodognium magnet. Also, at a foot a year, in 2 years he's no longer kinda cute, but a big toothy threat to humans too. Legally, (which is mostly how I like to do things), I can't touch him. So, in the near future, I'll be calling the nuisance gator hotline, where I'll probably be laughed at when I answer the "How long is he?" question. 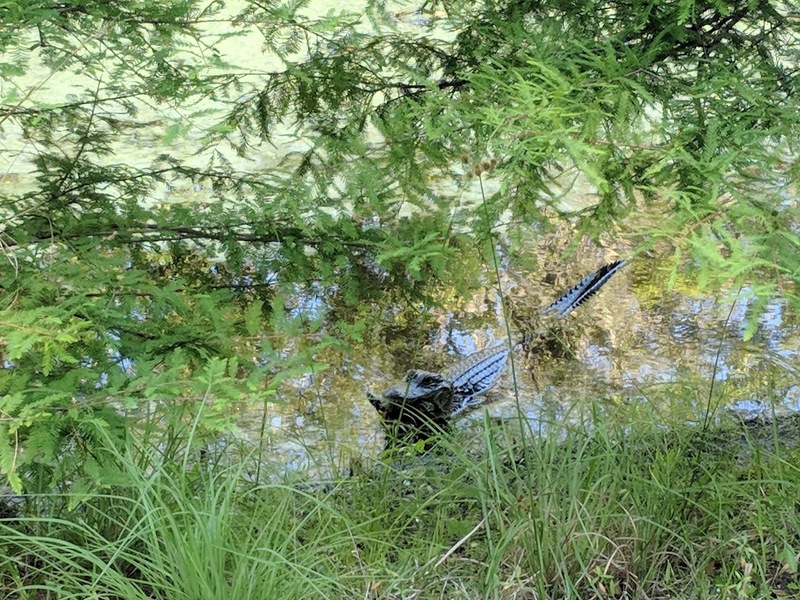 I have a feeling the turtle above (that's his head poking out of the gator's jaws) would've liked me to have made that call about 2 weeks ago. I have stealth blue jays, but nothing like this in the wilds of South Dakota. Yikes and double yikes. Having 3 black lab granddogs, you are totally on the mark with that scenario of escapees and the nearest water. And the nuisance gator people would probably rather deal with him now than in a few years. Yep, I would be calling the nuisance gator patrol right now. It must have been hungry to eat right there in front of you. It was probably sizing up it's next meal when it was following you around. Creepy. Water dragon. Wow. I agree with those who are in favor of making that call. WOW in every way! That's quite a guest to have in your pond there. Yes, a call to the nuisance gator people seems like the right way to go. Enjoy his rather startling and beautiful presence while you can. Stay safe and say good-bye to it soon. Thank you for the comments my friends. I'm going to call FWC tomorrow to start the ball rolling. It might take a while, since a little guy like this is not a priority. On the other hand, he is so unafraid of humans that it should be an easy take. I will keep you posted on this issue.